This is a 1000-page book that reports the votes of every single congressmen (representative and senator) in the U.S. congress, as well as every decision of other key leaders in the federal government, over the last 8 years, along with their lobbyist affiliations and a vote-by-vote, decision-by-decision comparison between the issue that was voted on or the matter decided and the lobbyists influencing the congressmen and the other key leaders. You will be able to see for yourself which congressmen and other national leaders sold their vote. Below is a sample graph from the book. 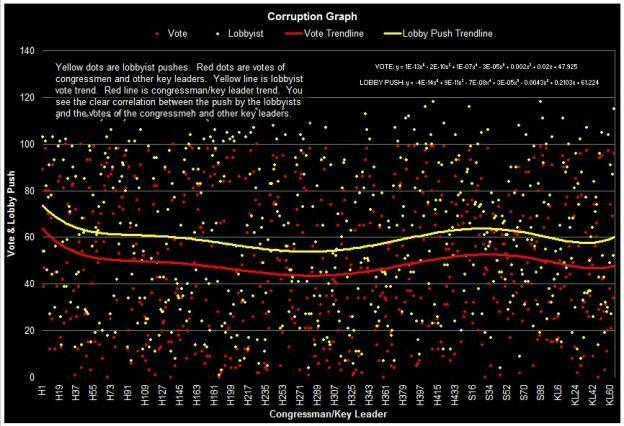 We call this the “Corruption Graph.” It shows the correlation between the push by lobbyists and the votes of congressmen and other key leaders. Yellow dots are lobbyist pushes. Red dots are votes of congressmen and other key leaders. Yellow line is lobbyist vote [that is, lobbyist push] trend. Red line is congressman/key leader [vote] trend. You see the clear correlation between the push by the lobbyists and the votes of the congressmen and other key leaders. Take this with you into the voting booth. Includes key statistics with graphs. This pamphlet is for those who want more information to guide their voting decisions. Includes contents of above pamphlet plus detail-level information and 50 additional pages of statistics and graphs. Includes contents of above booklet plus in-depth political analysis and meticulous issue impact analysis. The I2A (Issue Impact Analysis) explains how each vote affects you, your family, your standard of living and your pocketbook.